Brett Frischmann joins Villanova as The Charles Widger Endowed University Professor in Law, Business and Economics, effective August 1, 2017. He is the 2016-2017 Microsoft Visiting Professor of Information and Technology Policy, Princeton University, and a Professor at Cardozo Law School in New York City, an affiliated scholar of the Center for Internet and Society at Stanford Law School, and a trustee for the Nexa Center for Internet & Society, Politecnico di Torino. He teaches courses in intellectual property, Internet law, and technology policy. Frischmann is a prolific author, whose articles have appeared in numerous leading academic journals. He also has published important books on the relationships between infrastructural resources, governance, commons, and spillovers, including Infrastructure: The Social Value of Shared Resources (Oxford University Press, 2012), Governing Knowledge Commons (Oxford University Press, 2014, with Michael Madison and Katherine Strandburg), and Governing Medical Research Commons (Cambridge University Press, Winter 2016, with Michael Madison and Katherine Strandburg). 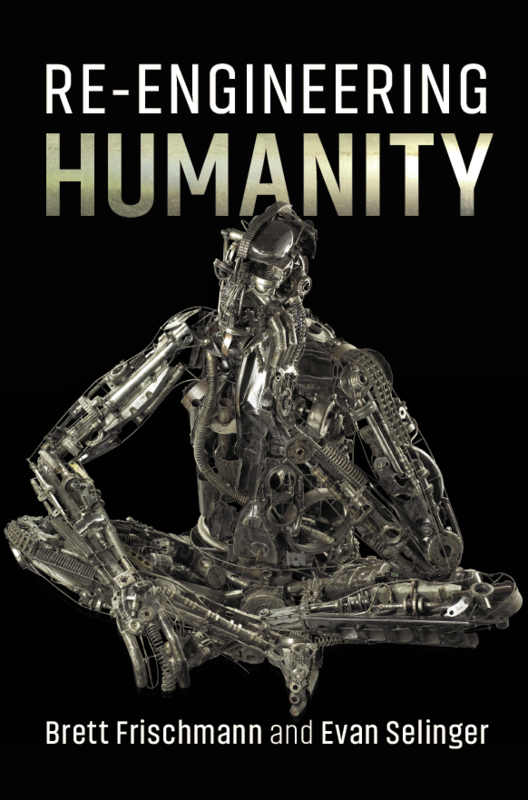 At Princeton, Frischmann has worked on his next book, Being Human in the 21st Century: How Social and Technological Tools are Reshaping Humanity (Cambridge 2017), which he is co-authoring with RIT philosopher Evan Selinger. He has examined techno-social engineering of humans, various ‘creep’ phenomena (e.g., boilerplate, nudge, and surveillance creep), and modern techno-driven Taylorism, and he has developed a series of human-focused Turing tests to identify and evaluate when humans behave like machines. Evan Selinger is Professor of Philosophy at the Rochester Institute of Technology, where he is also the Head of Research Communications, Community, and Ethics at the Center for Media, Arts, Games, Interaction, and Creativity. A Senior Fellow at the Future of Privacy Forum, his primary research is on the ethical and privacy dimensions of emerging technology. Selinger is a prolific writer and his next anthology is The Cambridge Handbook of Consumer Privacy, co-edited with Jules Polontesky and Omer Tene (Cambridge University Press, forthcoming 2018). A strong advocate of public philosophy, he regularly writes for magazines, newspapers, and blogs, including The Guardian, The Atlantic, Slate, and Wired.